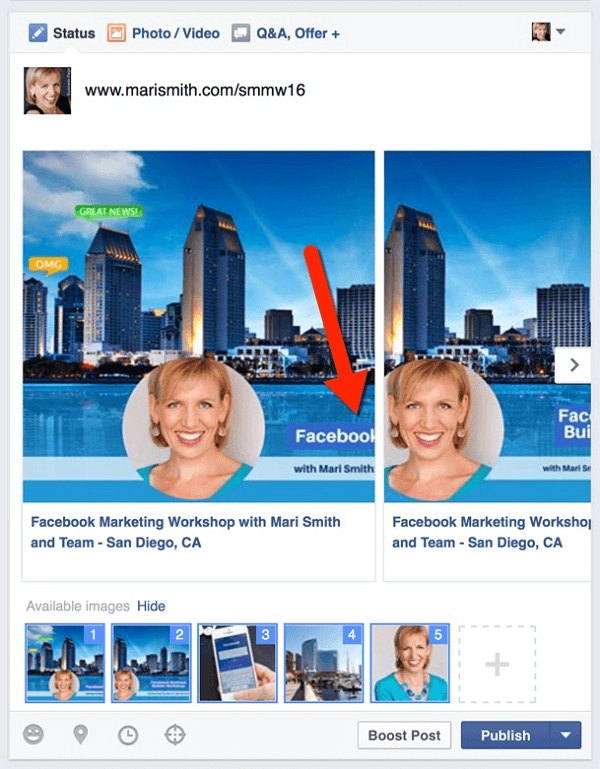 Want to use multiple images in a single Facebook ad or post? Have you tried Facebook’s Carousel feature? 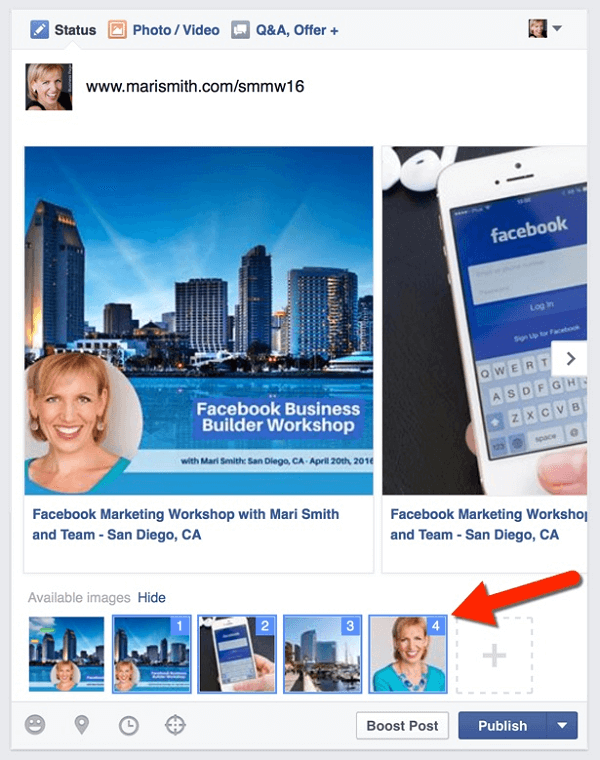 The Facebook Carousel feature allows you to publish multiple images and links in one post or ad. 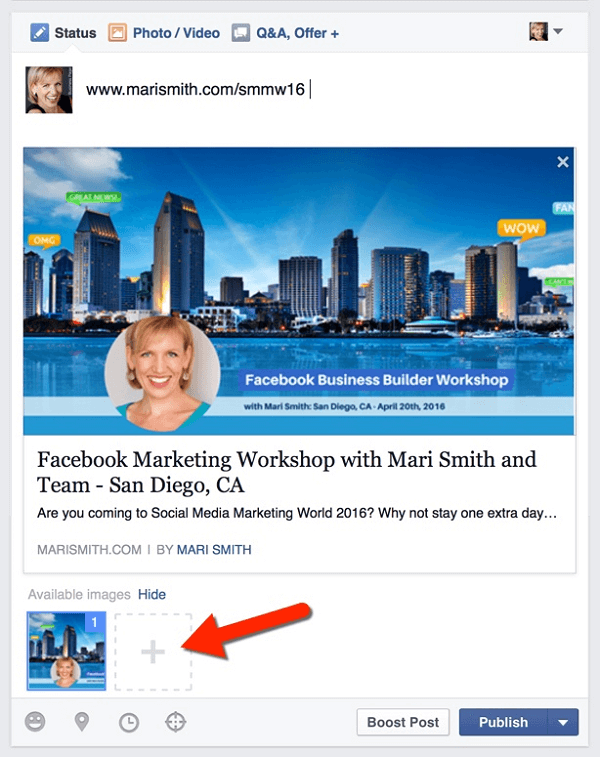 In this article you’ll discover how to set up and use Facebook carousel posts and ads in your Facebook marketing. 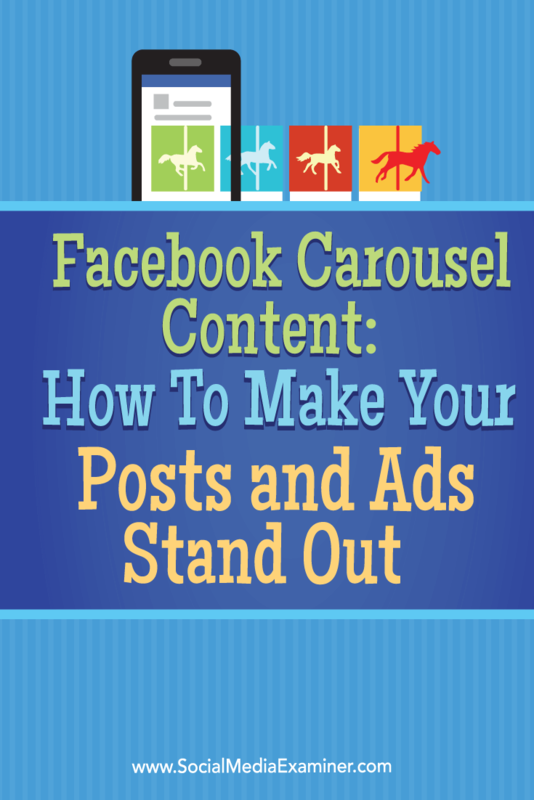 Discover how to make and use Facebook carousel content in your posts and ads. 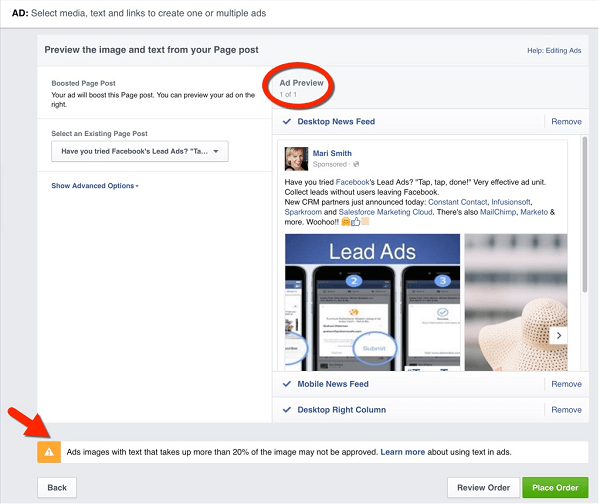 A Facebook carousel post or ad is a creative way to get more content into a smaller space. You can feature five unique images, each with different headlines, descriptions, and URLs all within the same story. Publish a carousel post or ad as an organic story on your page wall and/or an ad unit; either can easily be viewed on desktop and mobile. According to a report by Kinetic Social, carousel ads perform 10 times better than regular ads. Plus, since 90% of Facebook users access via mobile, that’s a great use of a small amount of real estate. Advertisers should get much more for their dollars by doing a horizontal ad unit that can scroll back and forth. Carousel ads are also available on Instagram. There are a few options when it comes to carousel posts and ads. Create an organic carousel post, turn an organic carousel post into an ad, or create a carousel ad from scratch. 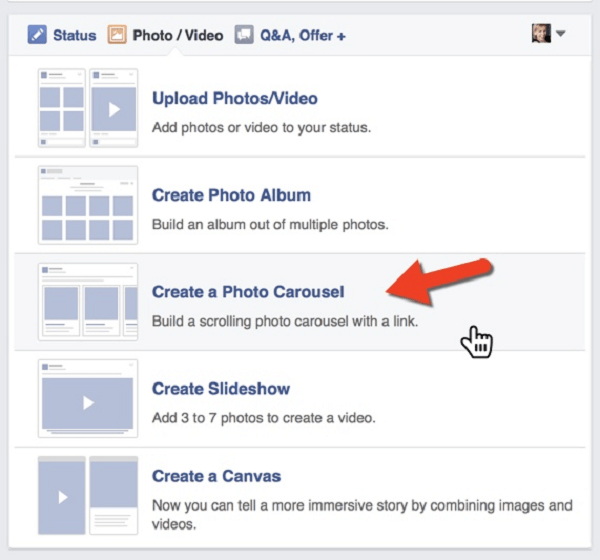 To create a carousel post directly on your page, type or paste a link on your wall. It automatically populates a preview, which should have at least one image. Remember, the more images in your blog post, the more will populate and the fewer you’ll need to upload directly. Typically, Facebook’s og:image tag on blog posts preselects the link preview image and most blogs only have one that populates when the link is shared on Facebook. So when creating carousel format wall posts, you’ll need to get creative with sourcing additional images. Usually you can find more images on the blog post you’re sharing. Paste a link and the images from your article will automatically populate. 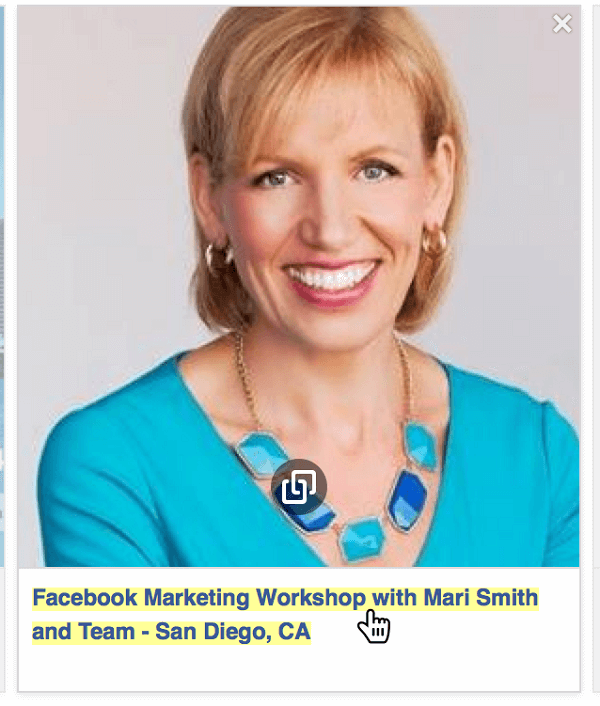 Most links you share on Facebook will automatically populate with that preview image, which is 1200 x 628 pixels, the standard dimensions for a link post or ad. However, since carousel images are square, Facebook will crop out the center of the image. If the original image gets cut off in a way that doesn’t make sense, you may need to remove the image that populates, and upload a square one. It’s recommended that you size carousel images at 600 x 600 pixels. 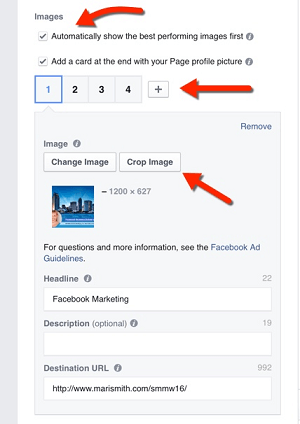 Facebook will center and crop any horizontal images, so you may need to edit and upload some of your photos. Click the plus sign and then upload additional pictures (up to five total) to use for your post. Select high-quality images that contain less than 20% text. This is especially important if you plan to turn your carousel post into an ad. 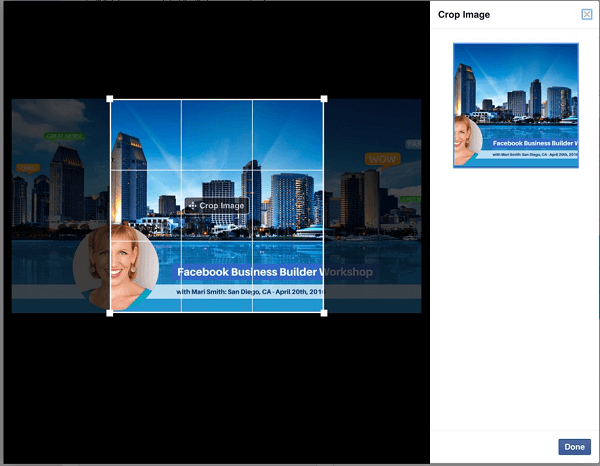 Use Facebook’s Grid Tool to make sure your images will be approved, should you decide to turn the post into a carousel ad. Drag and drop your images to change the order. Click the plus sign to upload any additional images. Drag and drop them so they’re in the right order. Hover over each image and click the link icon to edit each destination URL. Hover over each image and click Edit Destination URL. You’re also able to edit the headline. To edit the headline, just click. Click on the headline and then edit the text. Type in new text and hit Enter. 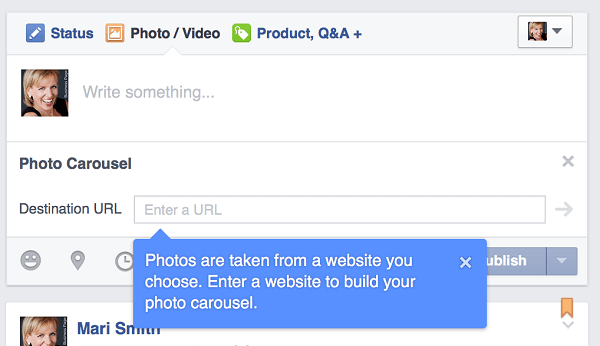 Your other option is to build a carousel post from the photo upload section. Go to upload Photo/Video and select Create a Photo Carousel. Select Create a Photo Carousel from the Photo/Video Upload section. Then add the link. It will populate the images and allow you to add more. Facebook will populate your images into the carousel post. Add new pictures if necessary, and then edit the links and headlines as above. After your carousel post gets some organic reach and engagement, you can easily turn it into a carousel ad by boosting the post. I recommend doing this through Ads Manager, rather than the Boost button, because there are more targeting and placement options. Go to Ads Manager and click Create an Ad. Select Boost Your Posts, and choose the page and the post. Go to Ads Manager to boost an organic carousel post. Set your audience, budget, and schedule. Then preview your ad. Preview your ad and put a checkmark where you want it to appear. Click the Place Order button when you’re satisfied with the ad. Again, keep in mind the less than 20% text rule. The carousel ad in the example above would likely not be approved. It’s not possible to change the images of carousel posts after they’ve been uploaded. So to turn my post in the above example into a carousel ad, I’d need to start again with a fresh carousel post or carousel ad from scratch. 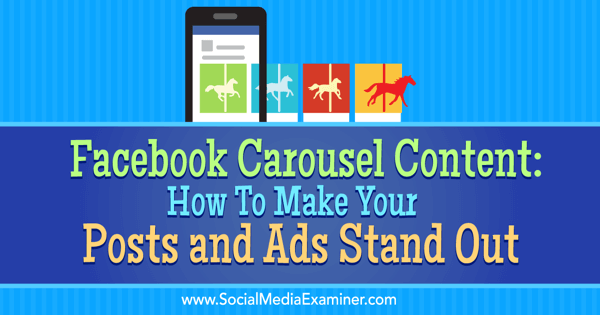 To create a carousel ad from scratch, go to Ads Manager or Power Editor. Select Create Ad and choose the objective. Decide between sending people to your website or getting conversions or downloads. 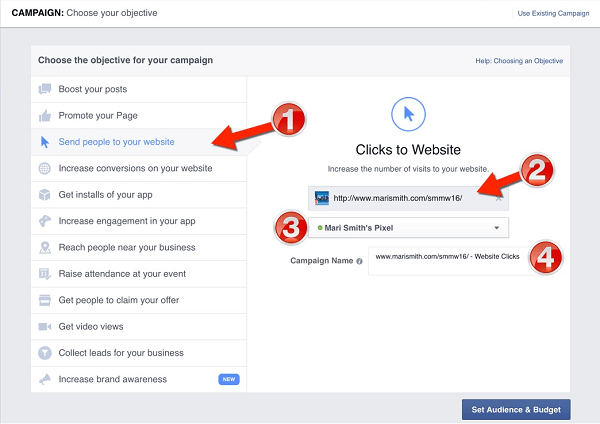 The Facebook ads algorithm optimizes ads to be shown to users who have a history of taking the action you select. Therefore, I suggest you select Send People to Your Website as the objective, since there are many more steps to identify people who have a history of converting. It’s far better to send people to your website and use the Facebook pixel, so you can then retarget visitors to your site. Create and configure the objective of your ad. After you set the audience and budget, choose your ad creative. Select Multiple Images in One Ad and upload your images. Click Create New Ad and select Multiple Images to create a carousel ad. Then upload up to five images. 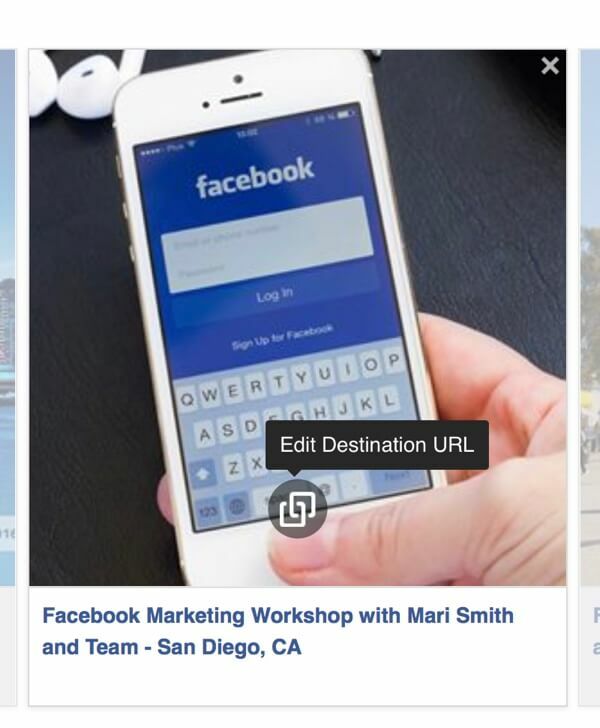 Edit the destination URL and add a headline for every image (which Facebook refers to as a “card”). Note: The ability to add video is rolling out gradually and will only be available in Power Editor. Click on the number buttons to upload an image and add a headline and URL. If need be, you can also crop the images from here. Crop any images that need to be square. You may also want to add a call-to-action button. However, keep in mind that adding a button will reduce how much space is available to show your headline and description. Another recommended option is to set your ad to show the best performing images first. You can also connect your Instagram account to show the same carousel ad on Instagram and maximize your visibility. When you’ve finished all of your customization, preview your ad and place the order. There are many ways to use carousel ads. For instance, a retail or online store can highlight multiple products, multiple features on a specific product, or one stunning image of a product spread out into multiple cards. A restaurant could share their daily, weekly, or monthly specials. Each card would lead to a different link. Also, you can use carousel ads to tell your brand’s story, feature key employees, or share how your product or service can help others. 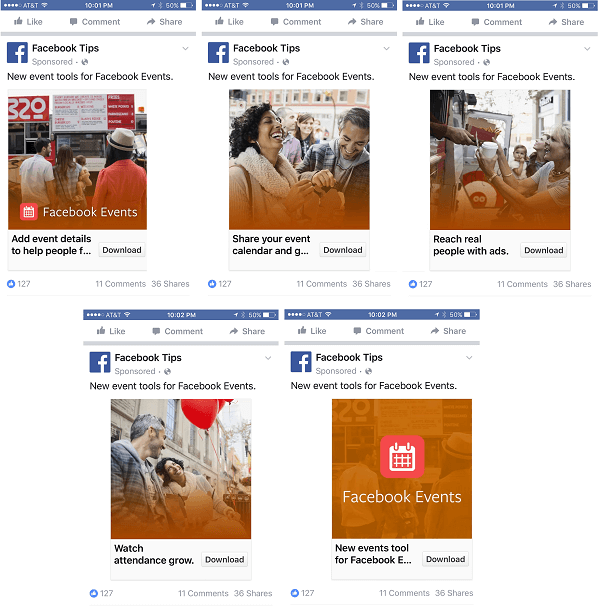 This carousel ad from the Facebook Tips page promotes the Facebook Event tool. This shows how you can use a different image and headline on each card touting the benefits with a call to action. Use different images to promote the same product and see which gets the best results. Recruiting software company Workable uses images branded with their company name on their carousel ad promoting the app. They use the description text as an add-on to the call to action, telling people to get their free trial. Brand your carousel images to make your company stand out. 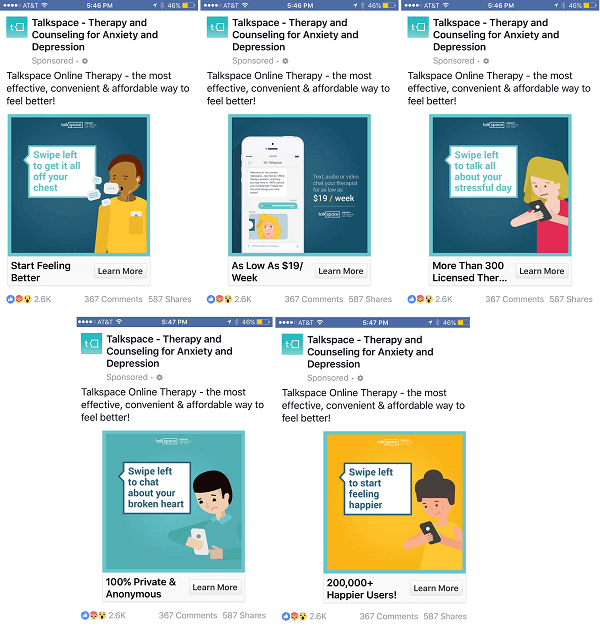 Online therapy app company Talkspace shares everything someone needs to know about their app, including how to use it, in their carousel ad. Their story is illustrated through cartoons, rather than photos, complete with word bubbles. Plus, Talkspace shares the benefits of their program through the headline bullet points. Demonstrate how your product works and tell your audience about it through your carousel ad. Facebook recommendations for best practices for carousel ads include consistency, creativity, and brand identity. You also want people to respond to your posts and click on the images/links. Therefore, use carousel ads to test headlines, copy, and offers and see what gets the best response. Once you know what works, experiment and take your carousel ads to a new level. See this Facebook page for more carousel format creative examples. Although carousel posts and ads show up great on desktop, it feels like they were made for mobile. Smartphone owners love scrolling through content without losing their place, and are easily engaged by these images. Whether you go the organic or promoted route, carousel posts give your readers fun, creative content with multiple places to click. They’re the perfect showcase for promoting your business’s story, products, and services. What do you think? 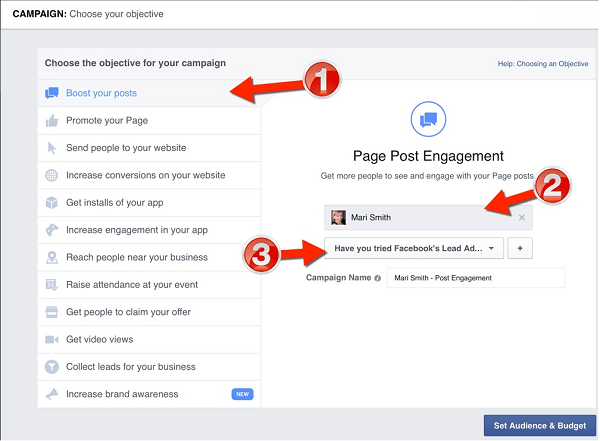 Do you use Facebook carousel ads and posts? What fabulous carousel posts have you seen? Please share your thoughts in the comments. 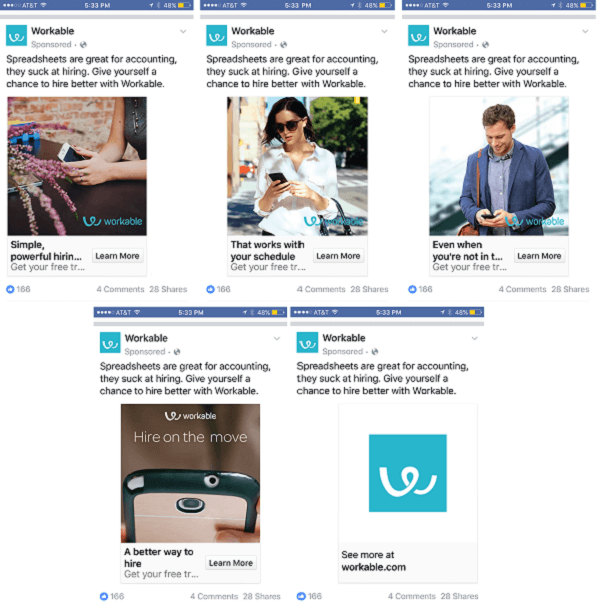 Tips on ways you can make your posts and ads stand out using Facebook carousel content.